Filice, Michelle. "Project Surname". The Canadian Encyclopedia, 21 March 2018, Historica Canada. https://www.thecanadianencyclopedia.ca/en/article/project-surname. Accessed 19 April 2019. In 1970, the federal government undertook a program, known as Project Surname, to assign last names to Inuit in northern Canada. Taking the census in Windy River, NWT, and checking on Family Allowances matters (10 December 1950). This boy is being identified by the disc number on his tag, attached to his parka. In 1970, the federal government undertook a program, known as Project Surname, to assign last names to Inuit in northern Canada. These surnames were to replace the personal disk numbers that Inuit had been given by the Canadian government in the 1940s. While some Inuit and non-Inuit peoples viewed Project Surname as a more effective and politically correct system of identification, others saw it as yet another instrument of paternalism. Today, Inuit use a mixture of Euro-Canadian and traditional Inuit names. Before the arrival of Europeans, the Inuit had a complex naming tradition. Inuit names reflected what was important in their culture, including the environment, animals, family and spirits. They believed that names carried life and personality. Consequently, the process of naming a child was about discovering who the child was, who they represented from the past and who they will become. Elders and family members often offered naming advice to the mothers of newborns. Sometimes, expectant mothers would claim to receive a name for their child from a dream or vision. In other cases, the simple gestures a newborn made could trigger memories of a deceased family member, who would then become the infant’s namesake. As a result, children sometimes received multiple names upon birth in order to decide which one(s) best suited their personality. If a name was thought to be a poor fit for a child, either because it did not reflect their personality or was believed to cause illness and misfortune, their name would be changed. If a child was named after a living family member, they would often grow to form close bonds with that person because they were now considered part of one another. It was also common for children to be named after lost loved ones. Since names were thought to carry life, naming a child after a deceased family member was a way of bringing that person back to the community. Inuit believed that children would take on some of the characteristics and personality traits of their namesake. However, since Inuit had multiple names, no two people were identical; each name carried with it different identities and powers. Since names were unique, the Inuit naming system did not recognize shared family names or surnames. Women did not take on the family name of their husbands, as was the tradition among Europeans. Inuit names were also not gender specific; males could be named after females and vice versa. It was believed that people with the same name were essentially one person, whether male or female. From generation to generation, Inuit namesake traditions served to bond families and communities, simultaneously ensuring the survival of Inuit culture. Christian missionaries and traders living and working in the Canadian North during the 19th and 20th centuries found Inuit naming traditions confusing. Europeans claimed that Inuit names were difficult to pronounce, accurately spell and understand. Some missionaries also believed that traditional Inuit names were related to paganism and shamanism. As a result, Europeans sought to influence the adoption of European names among the Inuit. Missionaries encouraged Inuit to adopt their baptismal, Christian names as their official names. This new system introduced gender-specific, Euro-Christian names to Inuit communities. Some Inuit only used their Christian names in the presence of missionaries, traders and government agents. Inuit who were fearful of the missionaries, however, wholly adopted new Christian names. While some individuals admitted that it was emotionally difficult to stop following Inuit namesake traditions, they decided that adopting European names would better serve their families in the long-run. David Arnatsiaq holding a small chalk board with his disk number, 6008, at Pond Inlet (Mittimatalik/Tununiq), Nunavut, August 1945. 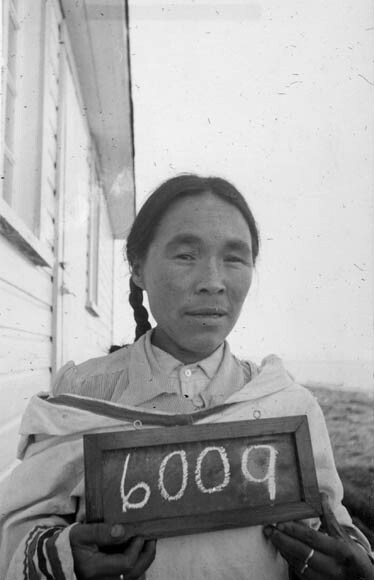 Tuurnagaaluk holding a small chalk board with her disk number, 6009, at Pond Inlet (Mittimatalik/Tununiq), Nunavut, August 1945. Young woman holding a small chalk board with her disk number, 6010, at Pond Inlet (Mittimatalik/Tununiq), Nunavut, August 1945. Church-led initiatives to alter Inuit naming traditions were followed by projects commissioned by the federal government in the 1920s and 1930s to make additional changes. The federal government sought to better identify the Inuit for administration of its programs and to compile census data. Similar to early missionaries and traders, federal government agents had difficulties documenting Inuit names, which were often long, causing inconsistent spelling and confusion in government records. Because women did not take their husbands’ last name after marriage, it was also challenging for federal agents to understand family relations. Inuit culture did not conform to the patriarchal, European social model, which confused government administrators. Rather than adapt their policies to accommodate Inuit naming traditions, the government sought other, seemingly simpler, solutions. 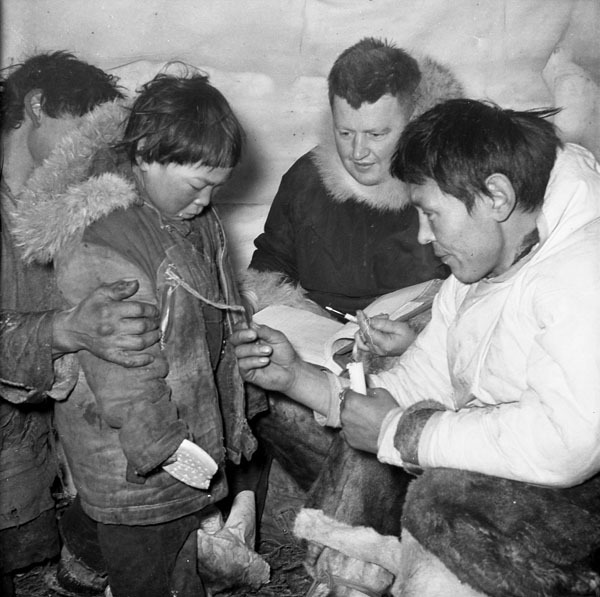 Civil servants posted in the Canadian Arctic in the 1930s tried to fingerprint the Inuit as a method of identifying and documenting Inuit communities. Some missionaries and federal agents protested this project, arguing that fingerprinting was associated with criminal activity, and consequently should not be used to identify innocent people. Others opposed the project based on logistics; travelling across the Arctic and fingerprinting Inuit who did not understand English proved exceptionally difficult. After failed attempts, Dr. A.G. MacKinnon, a medical officer posted in Pangnirtung (present-day Nunavut), wrote to the federal government in 1935 to suggest cancelling the fingerprinting project and instead assigning Inuit with identification disks. Nine years later, the Canadian government approved and implemented this system of identification. Starting in 1944, every Inuk received an identification disk that carried information about themselves and their place of residence. The disks were roughly 2.5 cm in diameter, burgundy in colour and made of pressed fibre or leather. The edge of the disk read “Eskimo Identification Canada.” The image of a crown was placed in the centre of the disk, below which was the identification number. This number contained several parts. The first piece of identification on the disk was either the letter “E” for “East Arctic” or “W” for “West Arctic.” This was followed by a number representing one of the 12 geographic locations of the Arctic, as defined by the administrators of this program. The last portion was a personal set of identification numbers used to reference individuals. Examples of disk numbers include that of Inuit leader Abraham “Abe” Okpik (W-3 554) and Commissioner of Nunavut Ann Meekitjuk Hanson (E7-121). The Inuit were expected to keep this tag on their person at all times. As a result, most Inuit either sewed the tag into their jacket or wore it as a necklace. Inuit disk numbers were also to be used in official documentation, including all birth, marriage and death certificates. While some Canadian policy makers found the disk numbers a useful way of documenting the Inuit, others, including Christian missionaries, considered them de-humanizing. Opponents likened the disks to military tags or hospital bracelets, worn by people who might have difficulty identifying themselves, which was not the case with the Inuit. The numbers, opponents argued, were nothing more than part of a broader plan to bring the Inuit under the bureaucratic administration of the Canadian state. Despite these protests, the disk system was used for nearly 30 years until 1972 except in Nunavik, in northern Québec, where the system lasted several years longer because it was administered by a different government. Inuit became accustomed to their disk numbers, and many actually argued that they were an easy and efficient way to communicate with government agents. However, in the midst of Aboriginal rights movements in the 1960s and 1970s, the disk system fell into disrepute and the Canadian government once again sought to change Inuit naming systems. Due to criticism of the disk system, the Canadian government and the Northwest Territories Council initiated a program in 1970 to replace disk names with surnames. 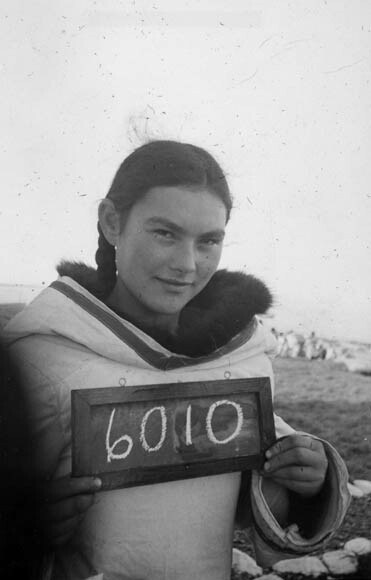 Opponents of the disk system argued that identifying the Inuit by last names rather than a series of numbers was more humane. Similar renaming projects had been conducted in other parts of the Arctic, including in areas of Greenland and the Soviet Union. Commissioner of the Northwest Territories Stuart Hodgson made this program — known as Project Surname — an official project of the 1970 Territorial Centennial. 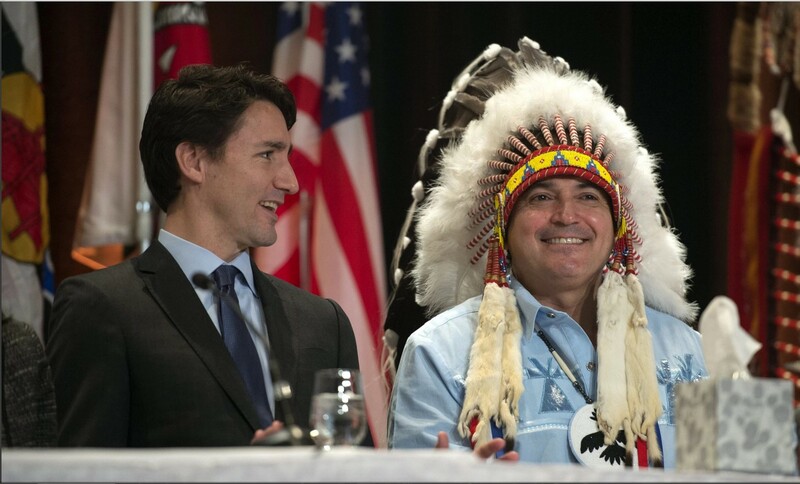 He also hired Inuit leader and Northwest Territories councillor Abraham “Abe” Okpik to carry it out. Okpik, who was fluent in English and knew various dialects of Inuktitut, was responsible for directing the assignment and registration of Inuit surnames. As he travelled to various Inuit communities, Okpik explained the new system to the locals, answering their questions and reassuring them that their surnames were to be their choice. Most people chose to be registered under their ancestors’ names. During this process, Okpik worked with a linguist as a means of using standardized spellings as much as possible. By the end of the project in 1971, Okpik had travelled over 72,420 km and interviewed more than 12,000 people. While some commended Okpik’s efforts, others found fault in Project Surname. The main purpose of the project — to assign surnames to the Inuit — was absurd, according to the project’s opponents, because surnames did not even exist in traditional Inuit culture. Project Surname only reinforced European naming methods and ignored traditional ones. In addition, despite assurances that the surname process was voluntary, many people had no say in their name choice. In some cases, people who were not home when the renaming happened returned to find that their family members had assigned them a surname. Children, for example, sometimes came home from school to a new name. Some also criticized Okpik for speaking mostly to men and for using men’s names as their family’s new surname. This became a source of distress for women who came home to find their identity overturned and reassigned. While Project Surname was supposed to protect and promote Inuit culture, some argued that it was only a continuation of paternalist policies. Some Inuit preferred the disk system to Project Surname, arguing that it was less disruptive to identity traditions and less intrusive than other bureaucratic interventions. 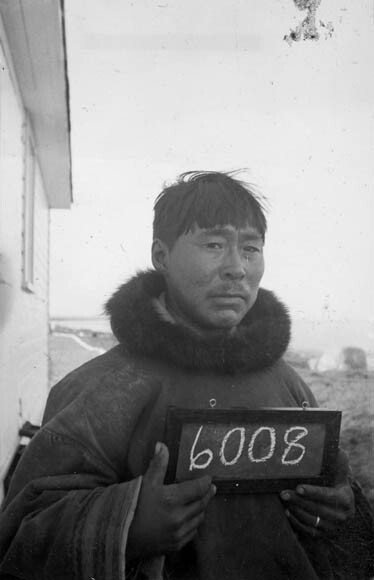 Most Inuit had accepted their disk numbers, and some had even become emotionally attached to them. The disk had become a part of their personal identity and family history. It was a symbol that reminded them of Canada’s colonial past and where the Inuit have come since then. Though the federal government no longer recognizes the disk numbers, some Inuit, especially carvers and graphic artists, continue to use their numbers as methods of identification. Officially, however, the Inuit today use both Euro-Canadian first names and Inuit middle and last names. After the establishment of the Nunavut territory on 1 April 1999, the Inuit became one of the first Indigenous peoples to retrieve territory based on ancient land claims. With it came a sense of renewed pride and a desire to reclaim Inuit cultural traditions and customs lost after colonization. Part of this reclamation movement included renaming geographical locations using Inuit names. As early as 1 January 1987, for example, the town of Frobisher Bay changed its name to Iqaluit, which means “fishes” in Inuktitut. Iqaluit was the term that the Inuit used before the location was renamed after Martin Frobisher, the English explorer who navigated the region in the 1500s.It was selected as the capital of Nunavut on 19 April 1995. The Nunavut Court of Justice also saw people seeking to change their own names during this time. While people who were given Christian names have generally kept them, and there has been no movement to remove surnames, there have been efforts to correct the spelling of surnames to make them sound more authentic and truer to Inuit languages. Since the 1990s, there has also been increased awareness and education about traditional Inuit naming systems in northern Canadian schools. In the Northwest Territories and Nunavut, for example, students learn about Inuit naming traditions in grade school. Social Studies and Northern Studies courses, first developed in the 1990s, use cultural curricula, such as Dene Kede and Inuuqatigiit, to contribute to students’ sense of identity and heritage. The introduction of disk numbers and surnames altered Inuit naming traditions and relationships between the Inuit and the state. However, in each case, the Inuit have found ways to counteract changes and preserve tradition. Today, the Inuit use a combination of Euro-Christian and Inuit names, emphasizing a return to traditional naming patterns. Pamela Stern, Daily Life of the Inuit (Greenwood, 2010). Valerie Alia, Names, Numbers, and Northern Policy: Inuit, Project Surname, and the Politics of Identity (Fernwood Publishing, 1994). Keith Crowe, A History of the Original Peoples of Northern Canada (McGill-Queen’s University Press, 1991). Hugh Brody, The People’s Land (Pelican, 1975). Pierre Robbe, “Les Noms de personne chez les Ammassalimiut,” Études/Inuit/Studies vol. 5, no. 1 (1981): 45–82. Minnie Aodla Freeman, Life Among the Qallunaat (Hurtig, 1978).